Melbourne is growing, fast. High rise and multi storey developments dominate the skyline. The maintenance of these architecturally diverse buildings requires the use of a range of high access systems. 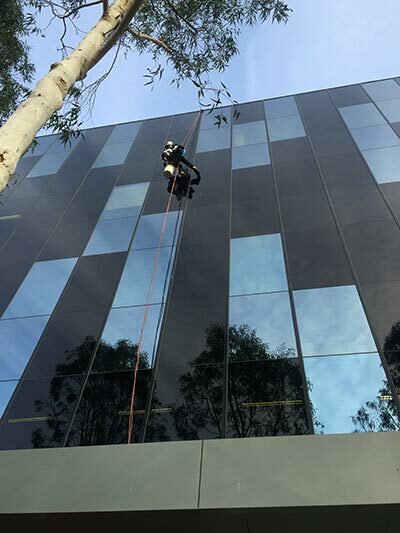 As specialists in high rise window cleaning, Realm Property Cleaning Services can provide you with cost effective window cleaning services for all your inaccessible glass and facades. For multi storey and high rise buildings below 72ft (5 to 7 storeys), our Reach & Wash system is the most efficient way to clean your inaccessible glass. 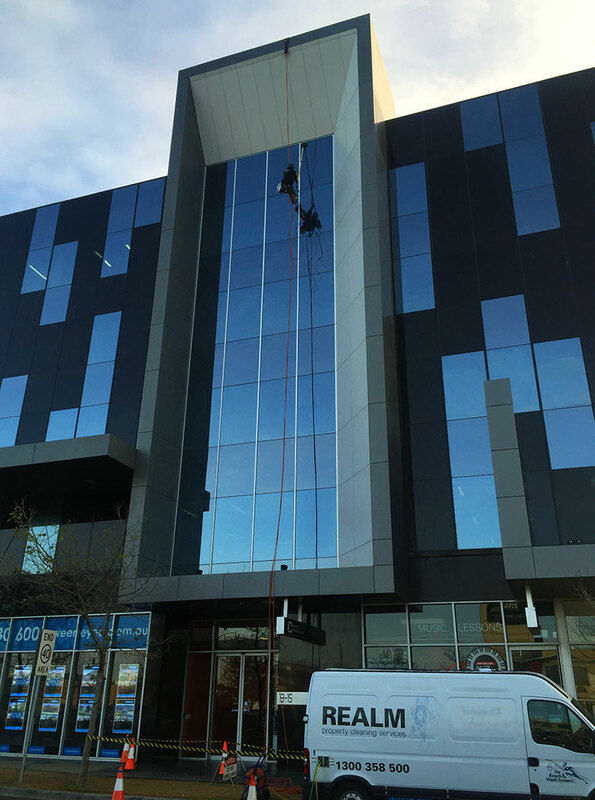 Window cleaning above 5 storeys usually requires a combination of high rise cleaning systems. 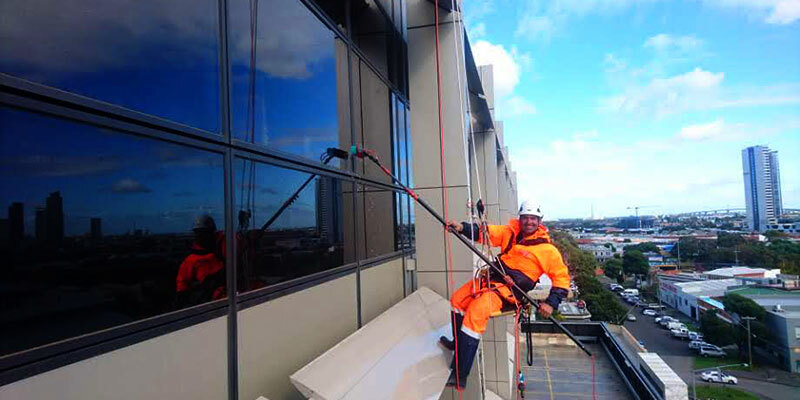 Realm PCS have professional IRATA and ARAA qualified high rise window cleaners for all abseiling work. Realm PCS are fully insured, qualified, and experienced in a range of high access solutions. 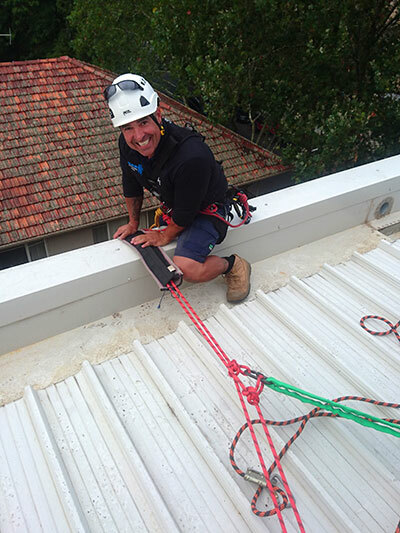 These include industrial abseiling (rope access window cleaning), the use of elevated work platforms (EWP – aka cherry picker or boom), as well as working at heights qualifications for using fall arrest systems. Call us today for a free consultation and high rise window cleaning quote. We will work with you to develop an access plan to reach all your windows in the most cost-effective manner possible. 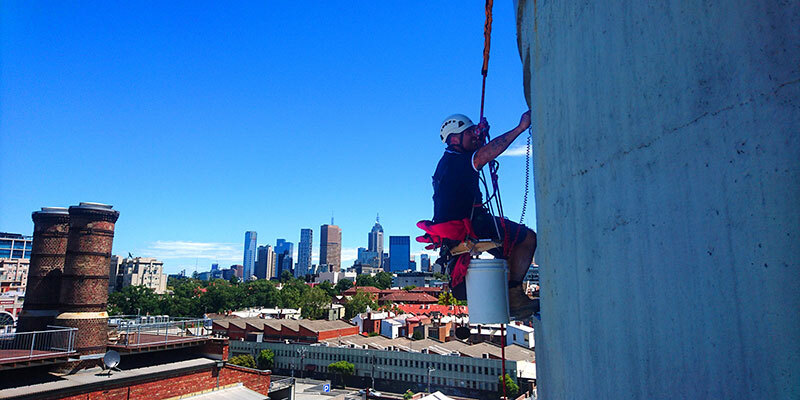 In order to quote your building effectively, we need to assess your existing abseiling anchor installations, and can assist you in ensuring all your high access systems are certified and safe. As leading providers of a full range of property cleaning services, we can not only wash your high-rise windows, we can also clean atrium glass, entrance-ways, and building facades. When you need a quote, ask us how you can save money by combining gutter cleaning with your existing property cleaning services. Realm Property Cleaning Services are Melbourne’s leading high rise soft washing service provider. 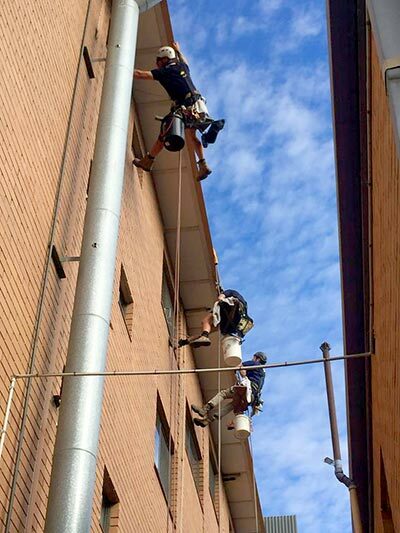 Combining our years of experience with water fed cleaning systems with rope access techniques allows us to offer you a revolutionary solution for facade and building wash-downs. For many years, pressure washing was the only solution for washing dirt, grime and mould from building facades. Our revolutionary soft washing system allows us to clean Alucobond, render, brickwork, weatherboard and more delicate building facades without the usual water ingress issues or damage to your property. With the soft nylon brushes, environmentally friendly cleaning solutions and the pure filtered water used in our Reach & Wash system, we can wash down your entire building including glass and balustrades for a sparkling finish. Perfect for paint preparation, post construction cleans, mould and moss removal, washing off the dust from nearby constructions, or as part of long term building maintenance. Soft washing is suitable for all building heights and construction materials, so ask us for a quote today! Why Choose Realm Property Cleaning Services? We understand that every building is unique, and have the skills and experience to apply the right technique and cleaning tools for each job. Because we offer window cleaning services that are tailored to your unique needs, our prices are competitive. In addition, our staff training, SWMS, site safety evaluations, and equipment certification are industry leading. Along with our extensive site safety procedures, policies, certificates and insurances, Realm PCS is CM3, Sodexo & IPRO approved. As a result, we service the needs of many residential aged care facilities, retirement villages, supported living and homecare facilities in Melbourne. Our Sodexo approval also makes us your first choice for educational institution cleaning, including schools and universities. We understand that as facilities and building managers, you face budget constraints and time pressures. Because we listen to your requirements, and develop a customised plan for your property, we are able to deliver efficient window cleaning services. We are committed to providing the best customer service. As a result, we always go out of our way to ensure our clients are happy. So for all your high rise window cleaning needs, contact us today for a consultation, or get in touch for a free quote.